Hi! 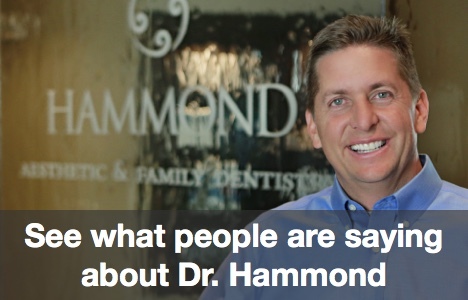 Welcome to the Hammond Aesthetic & General Dentistry blog, where we take the time to answer some of the questions dental patients in the Orem area are curious about. Today we are focusing on fabulous veneers, which are used extensively in cosmetic dentistry. When you get dental veneers, your cosmetic dentist will first make a model of your teeth. Then, a dental technician uses the model to create the veneers. In some veneer procedures, a small amount of the enamel from the face of the tooth has to be removed so the veneers can be placed. In such cases, the procedure is irreversible. If you are in the Orem area and are looking for a cosmetic, sedation or family dentist, give Hammond Aesthetic & General Dentistry a call. My name is Dr. Chris Hammond and we have been practicing advanced dentistry in the Orem area since 1996. The art and science of cosmetic dentistry is my passion. Please call 801-374-0070 and a member of our warm and friendly staff can answer any questions you have about veneers, teeth whitening, TMJ treatment, sedation dentistry, pediatric dentistry, general dental care, or smile makeovers. Are You Ready to Smile Again, Utah County?